Tired of dealing with Office 365 password expiration notifications? Learn two simple ways to configure user passwords to never expire. Need to know who’s logging in to your cloud directory or Office 365? With this tip, we’ll show you where to find information about Azure AD sign in activity. The new Netwrix 2018 Cloud Security Report analyzes the current state of security in the cloud and organizations’ plans to mitigate risks. 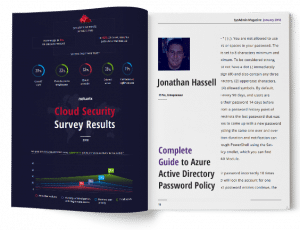 One of the benefits of Azure Active Directory is the flexibility it gives you when it comes to managing passwords. Azure AD password policy basics are described below. Do you ever need to know who created a new user mailbox or made changes to a user account’s permissions? This guide explains how you can better audit your Exchange Online environment. [Recorded Webinar] Cloud Security: Who is Responsible for Your Critical Assets? Watch our new webcast and learn what you need to keep in mind when your data resides in the cloud. Freeware service monitoring tool that enables you to monitor Windows services on your critical servers. See what users who were granted full access to a shared mailbox in Office 365 have been up to.